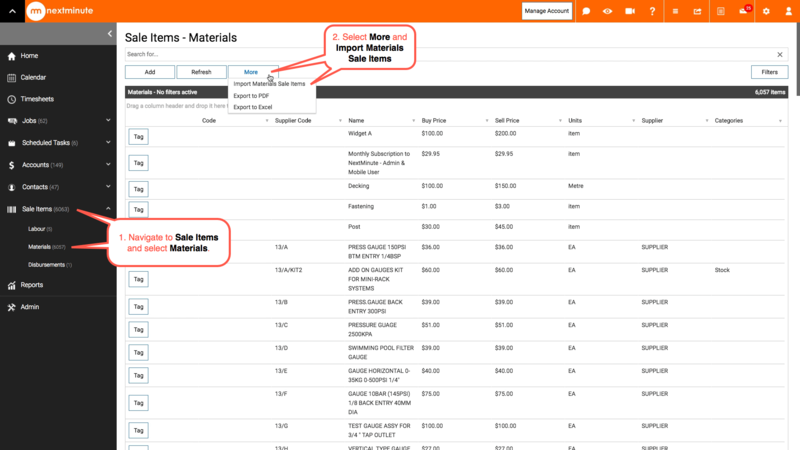 Importing materials/price books into NextMinute – Welcome to the NextMinute support and feedback centre. In this article we will take you through the steps to import materials into your NextMinute subscription. 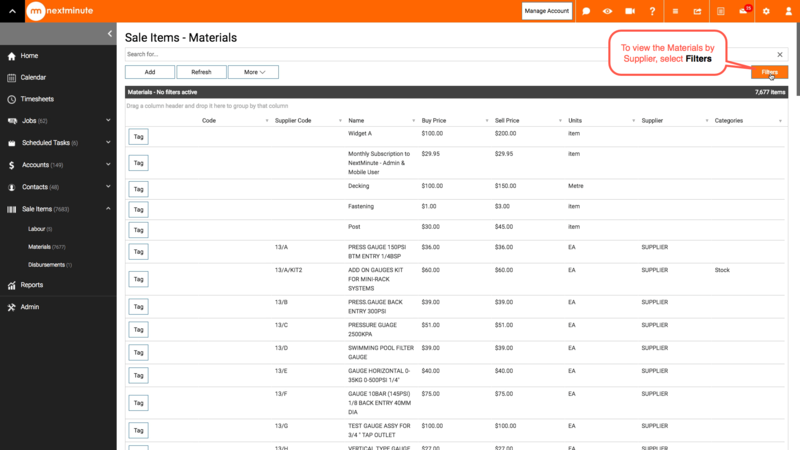 You can easily import your supplier price books into NextMinute to quickly add materials to jobs, quotes, orders and invoices. 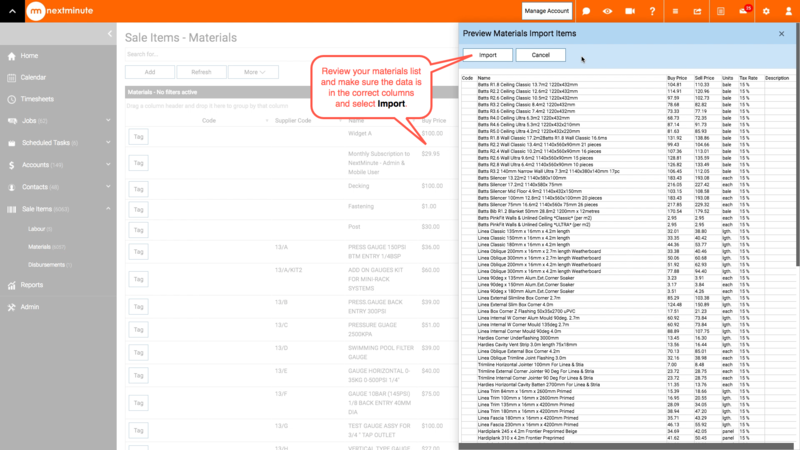 See the Generic Template section after Step 9 for more information on entering your materials into the generic CSV file to import into NextMinute. 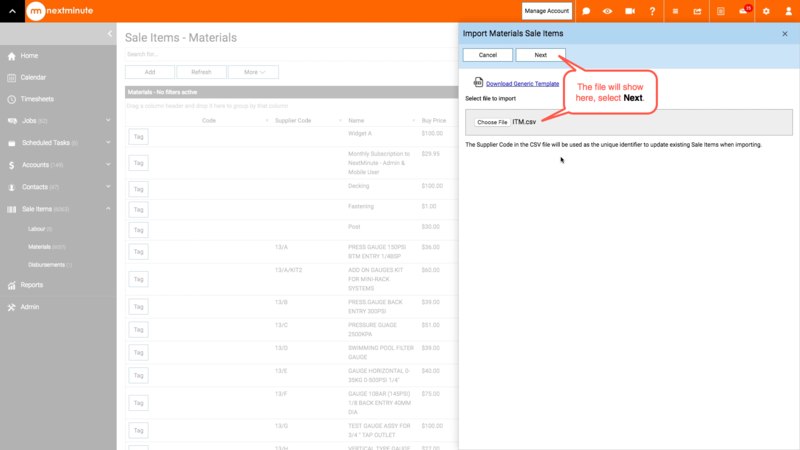 Once you have entered all of your materials into the correct columns of the generic template and saved as a CSV file, select Choose file from the import page (shown in Step 2 above), select the file and Save. 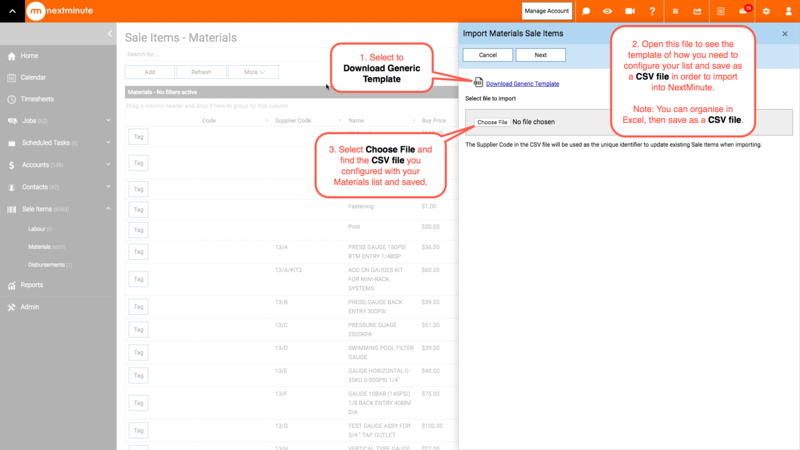 If you are importing a generic materials list go to Step 7. 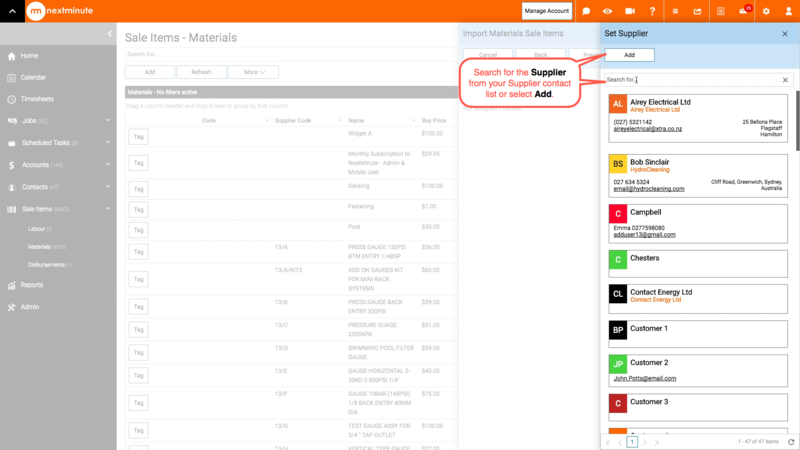 You may have already added or imported all of your Supplier contacts into NextMinute, you can select the Supplier that relates to the price book from your list or create a new Supplier contact. The Supplier will show under the Supplier header, as shown below. 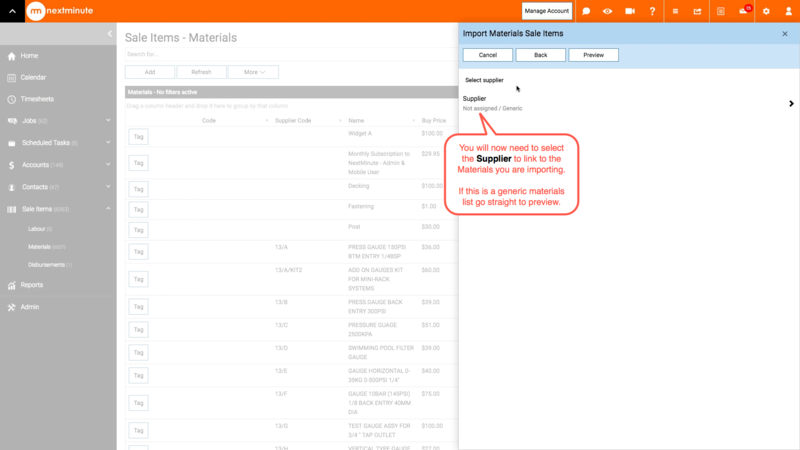 If you are importing a generic materials list, that doesn't need to link to a supplier contact, you can leave blank and go straight to preview, as mentioned in Step 5. Make sure you have entered all your data into the correct columns and when happy select import. 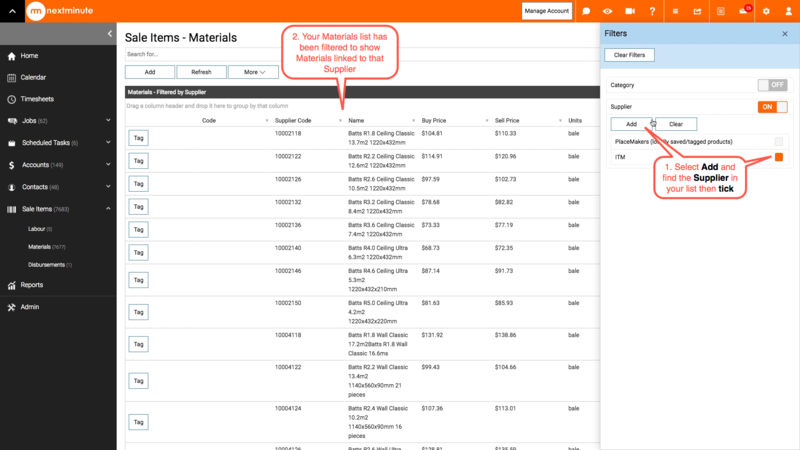 Step 9: You have successfully imported your Materials List! Internal Code is any code (100 characters MAX) that you want to use internally. Supplier Code is any code (100 characters MAX) that represents the code your supplier users for this product. Name is any name for the product. Buy and Sell Price is your buy and sell for this product. 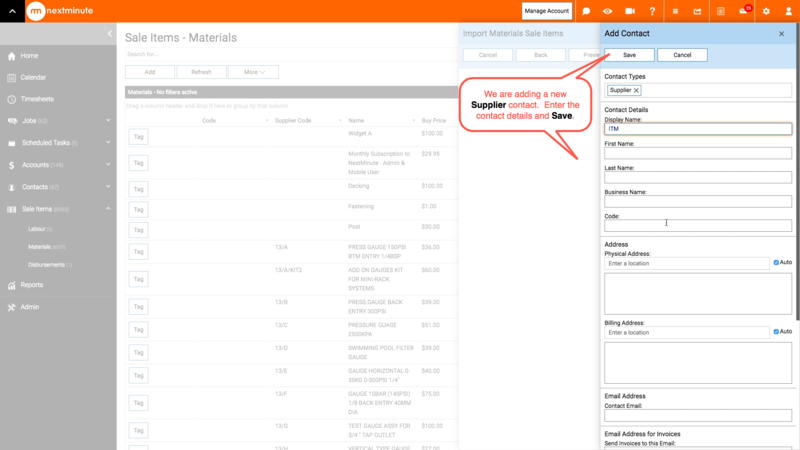 Category can be added if you want to organise your products into product groups. This is helpful when searching and filtering by category, making it easier to view in smaller subsets later. Description is any description for the product. This transfers to invoices and quotes as well. If a column description is not relevant for your business leave it blank. 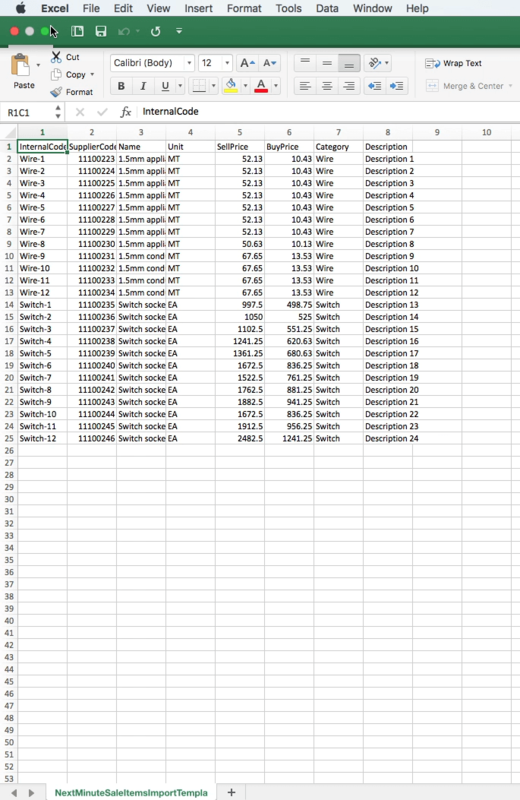 Note: any file created in Excel can be saved as a CSV (comma, separated version) file. After copying over or entering all of your product data into the columns save as a CSV file. 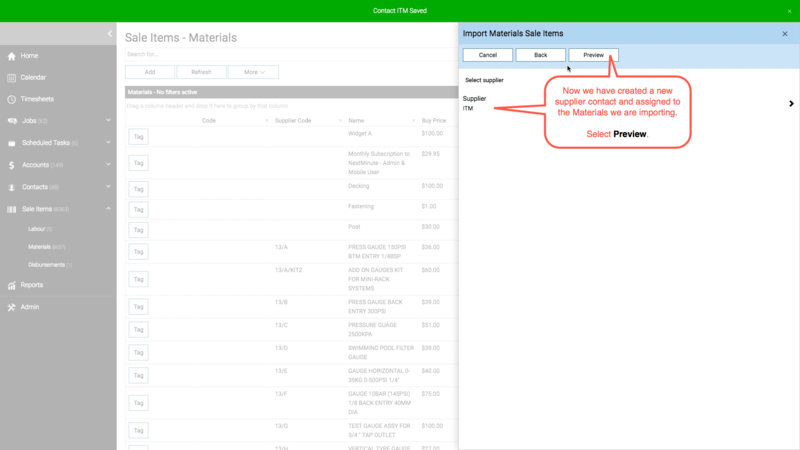 Save as: You will need to name the template, you may want this to be something along the lines of "Supplier Name pricebook for NextMinute" so you can easily find when importing. Where: Save your CSV file in a folder where you can easily find it when importing into NextMinute or for when you need to update in the future. File Format: Comma Separated Values (.csv).